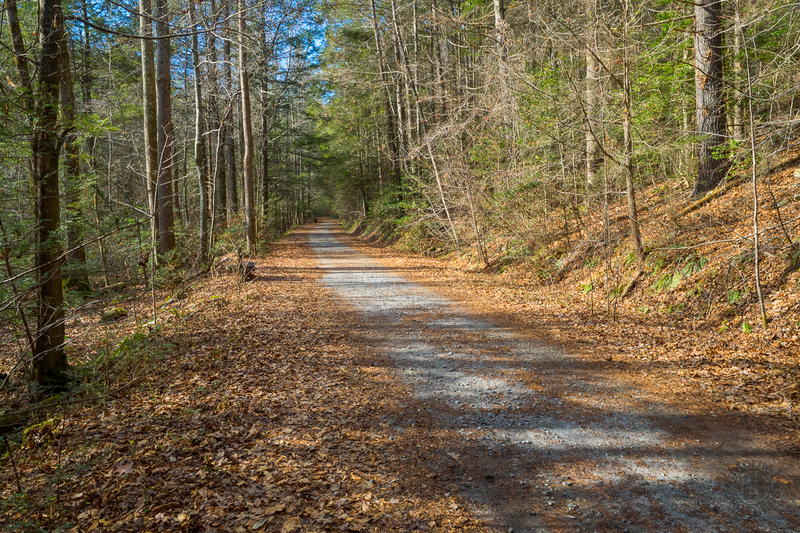 North Carolina’s South Mountains State Park has more than 45 miles of marked trails. 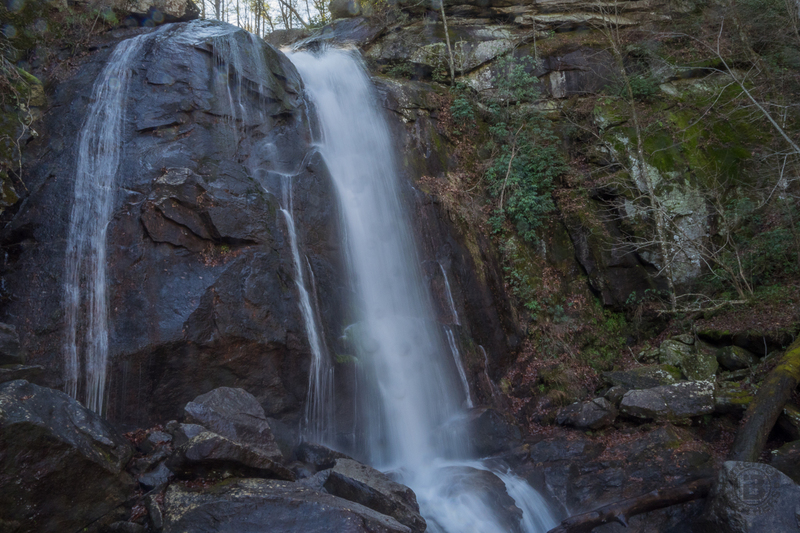 No doubt the most popular is the High Shoals Falls Loop Trail, a short, but tough climb to an 80-foot crystal-clear free-fall. Travel for a mile along rocky Jacob Fork River before beginning the steep ascent that requires stairs to navigate the tough terrain. From a viewing platform for High Shoals Falls, the trail continues climbing to the top of the falls, before looping down through the forest. In winter, you will also enjoy long distance views through the trees of the surrounding South Mountains. I hiked the High Shoals Falls Loop on Saturday, December 27, 2014 between 11:30AM and 1:30PM. My plan was to simply see what there was to see on this, my first visit to South Mountains State Park. Hike Rating: Moderate. Very strenuous, but short. Trail Condition: Mostly good. Some gravel road, some single track trail, some boardwalk. Watch for wet or icy stairs on the ascent. Starting Point: Loop trailhead at the end of S. Mountains Park Ave. Trail Traffic: There were scores of other folks at this extremely popular location. How to Get There: From Shelby, NC take Hwy 226 north 10.8 miles. Turn slight right on NC-10 for 8.5 miles. Turn slight left on Ward Gap Road for 4.3 miles past Mount Gilead Church, then turn left on Ward Gap Road for 0.8 mile. Take a sharp left up the hill on S. Mountains Park Ave. for 3 miles to the state park. Get a trail map and other info at the Visitor Center. The first thing I noticed about South Mountains State Park is that it is really remote. It takes quite a while to get there. The second thing I noticed was the four deer who crossed the road 50 feet after I entered the park boundary. That was a good start for my first visit to this state park located in west-central North Carolina, the largest in the state. The mountains are kind of unusual, in that they are isolated 40 miles south of the rest of their Blue Ridge brethren. While most peaks in the South Mountains Range average 2,000 feet elevation, there are ten that stand more than 2,500, with Buzzard’s Roost being above 3,000. When you hear about South Mountains, you usually hear about the big waterfall. So that was my first destination for the day. After stopping at the Visitor Center to pick up a trail map, I ventured to the end of S. Mountains Park Ave. The parking lot was a good indicator of how popular High Shoals Falls is. With room for at least a hundred vehicles, this place must get pretty darn crowded in summer. Even on this winter Saturday between Christmas and New Years the lot was half full. The trail begins on a wide gravel road that parallels Jacob Fork River. You’re surrounded by forest, predominantly oak, hickory, and a variety of pines. If you look closely, though, you will see the occasional maple, ash, or pawpaw. Tulip poplar and hemlock are here too, but most of them succumbed to the logger’s axe many years ago. There are plenty of wildflowers in Spring as well. 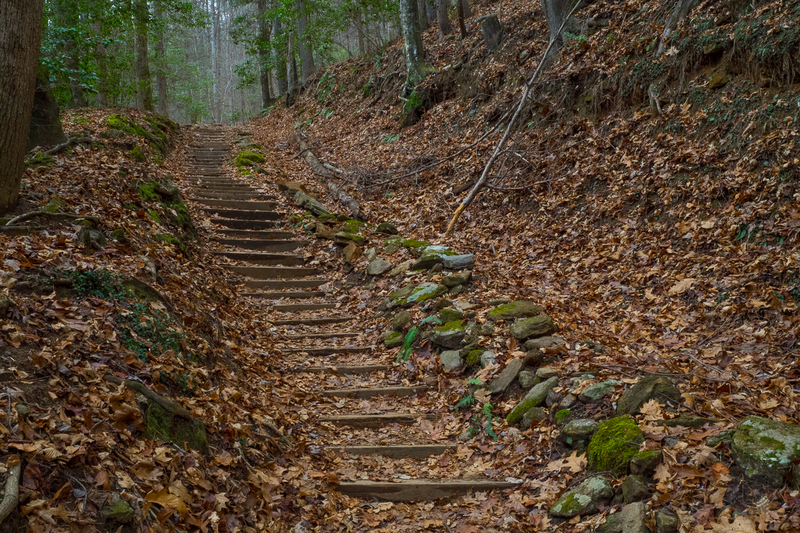 The High Shoals Falls Loop is also a geology education trail. Eight displays are located along the 3-mile route. They highlight the major geologic features along the trail, explain various weathering processes taking place, and identify major rock types found in the area. The sound of rushing water is always in the background from the river to your left. At the three-quarter mile mark the roadway crosses a wooden foot bridge over Shinny Creek and narrows to a single track. There is access along the creek and river here that gives you a good idea just how rocky the area is. It explains the rushing sound, as the river is perpetually whitewater. Not far past is a large picnic area and the beginning of the loop portion of the trail. It’s time to tighten the straps on your pack, make sure you have some water and a snack, and take a few deep breaths. The hike begins in earnest now as it starts to climb the gorge up to the falls. The trail winds in, around and over boulders that are wet from mist, and ever-increasing in size the higher you get. There are 10-20 foot cascades in the river every 50 yards or so, making for a very exciting backdrop. Where the rocks are just too dangerous to climb, they have constructed boardwalk and stairs to help with navigating the rugged terrain. While it was pretty warm the day I was there, I suspect the wet wood can become quite slippery on a cold day, so watch your step. I’m a firm believer in the leave no trace principles, so I had mixed feelings about the boardwalk construction. However, because of the amount of traffic the trail gets, it is a much needed safety precaution. The boardwalk also just happens to make a nice platform for photography. The last quarter mile the climb gets really steep… resorting to stairs and hand railings. The good news is the occasional bench placed strategically to allow a chance to catch your breath. I availed myself of more than one. Resting on a bench also offered the opportunity to see the view behind me. It was a bluebird day, and the high ridges of the South Mountains cast long shadows over the Jacob Fork gorge. Finally you reach a large wooden viewing platform for High Shoals Falls itself. This is a pretty big waterfall, crashing on the rocks 80 feet below the precipice. It is also 30 feet wide, so it can support a lot of water during rainy season. I had to laugh at myself standing at the platform railing. I spent more time wiping the misty spray from my camera lens than I did actually taking photos. You are that close to the falls. There is a cave to the left of the falls, created by a rock slide long ago. Absolutely no swimming is permitted near the falls, as deaths and injuries have occurred through the years, primarily to people who swim at the top of the falls. Four people have died at High Shoals Falls since 1993, including a 17-year-old who fell to his death in June, 2011. So please stay in the enclosed spaces. I noticed a number of people turning around at this point and returning down the stairs. The loop trail, however, continues up more stairs to the top of the falls where it eventually crosses the river over a foot bridge. It is quite lovely up there, so don’t cheat yourself by turning back at the falls. There are more, smaller cascades in the river, as well as a great view of the mountains across the gorge. The photo at the top of this post was taken above the falls. Click it for a full-size image. There are also picnic tables up there, so I took the opportunity to enjoy lunch. It’s a classic scene. Surrounded by rhododendron bushes, so this has to be a flowery cove come June. The calm of the river as it approaches the loud precipice just downstream, with the bright blue sky reflecting on the ripples of the current was mesmerizing. There aren’t as many people up here as there are down below, so it feels more wild. The loop continues in a northeasterly direction, still uphill, past large outcrops of granite. It’s quieter here. You’re away from the rush of the river, and I only saw a handful of others on the remainder of the loop. You come to a trail junction that goes into the backcountry. There are campsites at Jacob Branch, and another waterfall named Upper Falls that are several miles distant. Backcountry permits are available in the Visitor Center. Soon after the junction you reach the top of the climb. As they say, it’s all downhill from here. For the next half mile the trail descends, sometimes steeply, through magnificent hardwood forest. With the leaves down, there are nice views of the surrounding ridges and the bright, bright blue of the winter sky. I was completely alone now. I could actually hear the songbirds — and the rustling of the breeze — rather than the rush of the whitewater. I sat on some log stairs in a switchback to breathe it all in. I was descending these stairs, but I couldn’t resist the look back up, to the forest above and the serenity of the moment. Eventually I popped back out at the picnic area at the loop junction. There were even more folks there now, mostly families enjoying the surprise beautiful weather of late December. I crossed Shinny Creek again, and dropped off the main roadway to a side trail called the Hemlock Nature Trail that runs right along the river bank. The hemlock were once plentiful here, both the Eastern and Carolina varieties. Logging and woolly adelgid blight have taken the grandfathers, but you can still enjoy saplings of this graceful tree. You also pass an amphitheater along the nature trail, with seating enough for at least a hundred. There are informational kiosks describing the flora that abound here, and the wildlife that occasionally come out to play. There are plenty of large boulders along the river that are perfect to take a load off and dip your toes. Just what you would expect from a state park. In summary, when you make it to South Mountains you really should experience the High Shoals Falls Loop Trail. Yes, it’s touristy, and yes, it’s crowded, and yes, you have to work hard to get to the falls, but c’mon, you can’t have the woods all to yourself everywhere you go. It is a nice, big waterfall that will shower you with a refreshing mist. You will find peace and solitary on the upper portions of the loop. Besides, it only takes a couple hours, so there is plenty of time left in the day to explore dozens of other trails within the park. Enjoy the photo gallery!